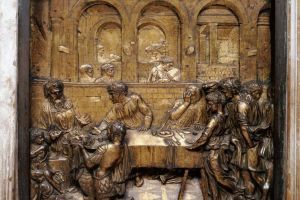 The bronze panels on the baptismal font illustrate stories from the life of Saint John the Baptist, a sort of ‘sculpted biography,’ as narrated in the Gospels. I. Announcement to Zechariah of John’s coming birth The narrative begins with the panel in front of the altar, finished by Jacopo della Quercia in 1429. The scene shows the moment when the Archangel Gabriel announces to the elderly priest Zechariah that his barren wife Elizabeth will conceive a son (Luke 1:5-25). II. 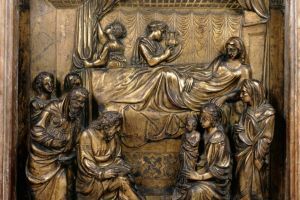 The birth of John the Baptist Turino di Sano and his son Giovanni di Turino were commissioned to provide two stories for the baptismal font, the Birth of John the Baptist and his Preaching, modeled from 1418 to 1420 but delivered only in 1427. 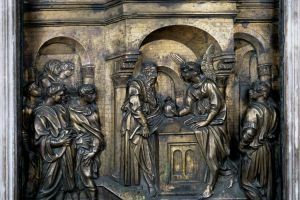 In the Birth of John the Baptist, besides the scene where Elizabeth has given birth, we see on the left Zechariah writing John’s name on a tablet (Luke 1:57-58). Zechariah had been struck dumb because of his incredulity at the Angel’s announcement, and only recovered his power of speech after he confirmed that the name of his son was the one the angel had told him. III. The Preaching of John the Baptist The next panel shows John the Baptist Preaching. 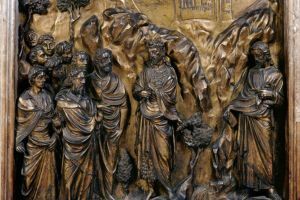 Matthew (3:1-12) explains that “In those days John the Baptist came, preaching in the Desert of Judea and saying, ‘Repent, for the kingdom of heaven is near.’… John's clothes were made of camel’s . . .
Jacopo della Quercia, Announcement to Zechariah of John’s Birth, 1429. Turino di Sano and Giovanni di Turino, The Birth of John the Baptist, 1418-1420. Turino di Sano and Giovanni di Turino, John the Baptist Preaching, 1418-1420. 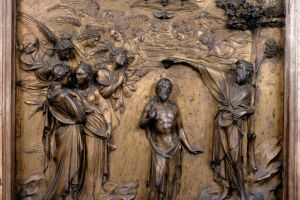 Lorenzo Ghiberti, The Baptism of Jesus, 1427. 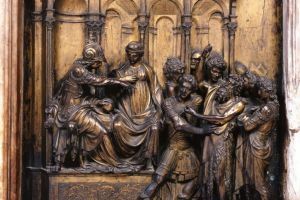 Lorenzo Ghiberti, The Capture of John the Baptist, 1427.